Using crankbaits for Guntersville bass can be productive all year. Even during water temperatures as cold as 42 I have used crankbaits to catch bass and nice ones too. As a rule, over the years it has been mostly rocky points and rip raps that hold the most cranking bass. Winter rip rap cranking seems to evolve some very important factors. The older the better, all new rocks are not good. Also look for rip raps that have many different size rocks. Some places will have bigger rocks on one end than the other. The reason for a variety of different sizes is the small rocks attract and hold the prey and the bigger rocks attract hold the bass. Loose one and you loose both. The older rip raps where built before we such good rock breaking methods, therefor huge rocks might have been dropped in first. Not all of the huge rocks landed and planned so they may create images on our LCR to keep and eye out for. But do not let the presence of new rocks fool you, because there may be plenty of old ones left near the bottom. If you choose to crank rip raps well there are plenty of them to be found on Guntersville Lake. As far as the correct types of rock points, they are found mostly on the lower end. Actually, almost all of the ones on the lower end have rocks somewhere on them. Just because you do not see rocks on the bank or even if someone has built a sea wall, they can still be worth looking into. The best way to tell if there should be rocks on a specific point, is with your map. Points that drop off fast are less likely to be covered in mud. Plus points that are near creek and river channels are most likely be washed down to where rocks are all that remains. Ultra sharp hooks are a must. 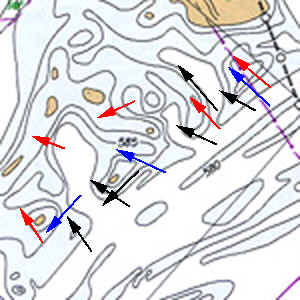 The two maps above show a way to approach new crankbait water. The red arrows show places to try a very shallow running crankbaits. 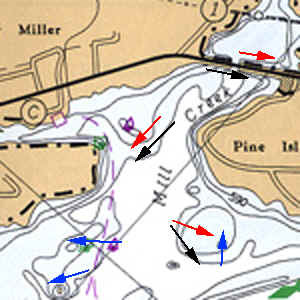 The blue is marking medium runners and the black are the deepest cranking. I most cases you will have to try several depths before you can eliminate an area.